Benjamin Schreier is suspicious of a simple equation of cynicism with quietism, nihilism, selfishness, or false consciousness, and he rejects the notion that modern cynicism represents something categorically different from the classical outlook of Diogenes. He proposes, instead, that cynicism names the difficult position of not being able to recognize the relevance of democratic social norms in the future and yet being nonetheless invested in the power of these norms to determine cultural identity and to regulate social practices. In his readings of Henry Adams’s Education, Willa Cather’s The Professor’s House, F. Scott Fitzgerald’s The Great Gatsby, and Nathanael West’s Miss Lonelyhearts, the author affirms that cynicism is an important and under-appreciated current in mainstream modern American literature. He finds that, far from the simple selfishness or apathy for which it is so often dismissed, the cynicism in these texts is suffused by a desire for the certainty promised by norms such as national teleology, ethnic identity, and civic participation. But without faith in the relevance of these regulating terms, cynics lack ready accounts of America and of their place in it. Schreier’s focus is not only on the cynical characters in the texts but also on the textual and epistemological strategies used to render normative narratives recognizably legitimate in the first place. In his refusal to historicize cynicism away with generalized claims about American society, Schreier argues instead that cynicism stages an unanswerable challenge to the specific expectations through which normative accounts of history become visible. 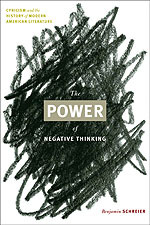 The Power of Negative Thinking makes a vital and wide-ranging contribution to our understanding of American literature, intellectual and cultural history, philosophy, ethics, and politics. Schreier’s close reading and his vigorous theoretical examination of analytical first principles combine to make a book that is valuable not only to the study of methodology but also to the scrutiny of the very assumptions the humanities bring to the exploration of the way we think.